Walied Hanaif, of Ansonia, in his new open air restaurant, Flames Mediterranean and American Grill, at 12 Daniel Street in Milford, Conn. on Tuesday, June 13, 2017. MILFORD — Flames Mediterranean & American Grill may not have a patio, but thanks to the new restaurant’s folding glass walls, visitors on Tuesday were still able to enjoy the pre-summer heat wave. The establishment opened three weeks ago and already the seats closest to the walls on either side of the entrance, which open up like doors by folding in, are proving the most popular in the place. “The doors cost so much, but they’re worth it,” said Flames owner Walied Hanaif. 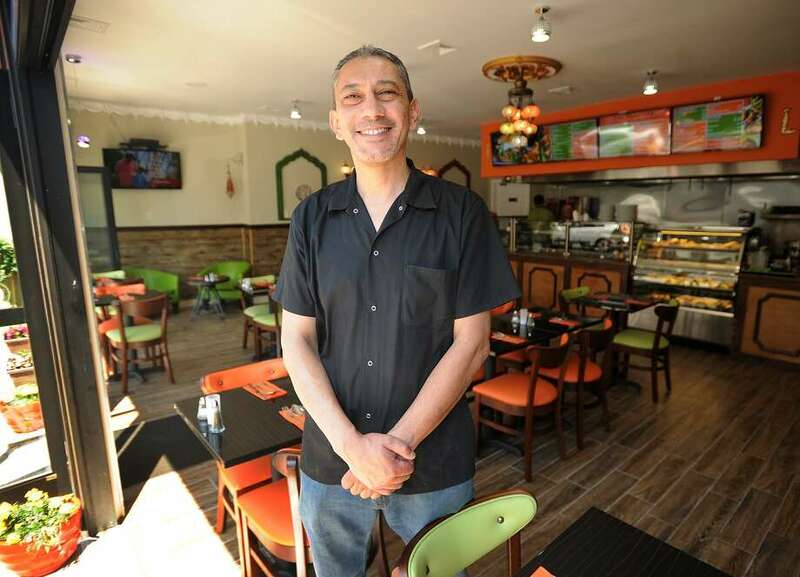 Hanaif, of Palestinian descent who now lives in Ansonia, said he’d always wanted to open a sit-down restaurant — he previously owned a deli in New York City — but couldn’t find the right location. Then, on a trip for ice cream in downtown Milford, he drove by the former bookstore at 12 Daniel St.
With it’s orange and green decor, including a small lounge-type area, unique crown molding and a colorful chandelier, the restaurant gives off a cozy and upscale vibe. Hanaif said he hopes customers feel at home there. Despite the usual downtown parking woes, Hanaif said Flames has been busy since it opened. He said he initially ordered 800 to-go menus and ran out quickly. “People are starting to talk about us, little by little,” he said. Besides falafel, a well-known Middle Eastern dish, Hanaif, who is one of three cooks who work in the kitchen, said it was important to him to offer traditional dishes found in that part of the world. Menu items include shawarma sandwiches, where fresh meats are placed on a vertical spit machine where it is grilled and then served on pita bread or wraps, and tabouli salads, with parsley, tomatoes and mint. The restaurant also offers a sfeeha dish, or meat pie, and spinach pie. Flames also offers a limited variety of cakes and pastries for dessert. True to its name, however, the restaurant also has American dishes, like the popular Flames Burger. The establishment does not serve alcohol, but Hanaif said customers are free to bring their own bottles. Flames is now open from 9 a.m. to 9 p.m. every day, except Sundays, when it closes at 5 p.m. Hanaif said he had initially planned to close Sundays but nixed that idea when he saw a demand for opening that day of the week, as well. He said he will likely expand its hours on Friday and Saturday nights this summer, as people are out later when the weather is nice. Flames can be reached at 203-693-2004.